One of biotech’s original and most prominent companies, Genentech was in the midst of some big changes. With increased competition from both startups and biosimilar drugs, the company was placing a much-elevated focus on product marketing to better promote its life-saving science. Additionally, a company-wide adoption of agile methodology, internally known as ‘New Ways of Working’, was being rolled out in an effort to make the company more nimble. Genentech’s Marketing Excellence (MX) team was charged with fostering both of these initiatives for the marketing group – a mission critical task in Genentech’s new path forward. Needing an online solution to engage, support, and train its marketers, the MX team engaged Marker Seven for the project. 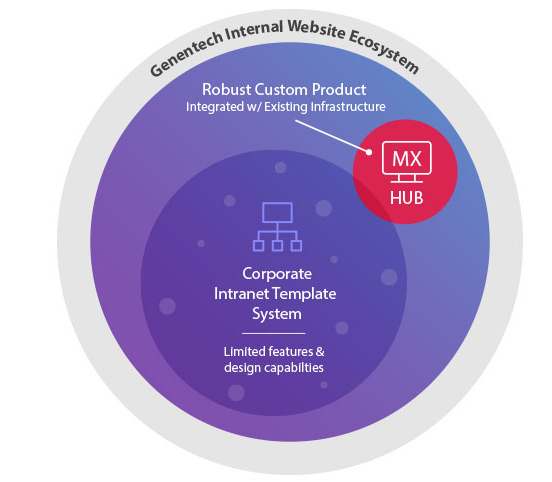 The result was the MX Hub, a ground-breaking product that provides the assets, tools, and training Genentech marketers need to excel at their jobs. One of our first decisions in the product’s design was whether or not to leverage Genentech’s existing intranet template system. Genentech typically relies on this system for internal projects because it’s easy to implement and support. However, our in-depth discovery process quickly revealed the system was too inflexible and simplistic to support the multitude of features necessary to meet the project’s objectives. Ultimately, Marker Seven recommended the Hub be a totally custom product that lives within Genentech’s overall IT infrastructure – yet outside the existing, rigid template system. Although Genentech IT jokingly calls this approach ‘going rogue’, the approach freed the MX team to dream big and get the product it desired. Furthermore, we implemented the site to work with single sign-on capability so anyone logged into Genentech’s network can access the Hub, as well as log-in/out from it. 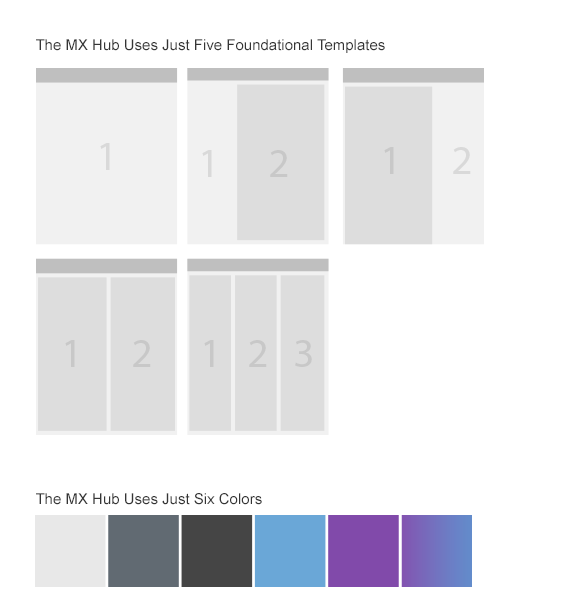 Since the MX Hub is a completely new concept, agile methodology was a perfect approach for design and development. The MX team was keenly interested in using agile to demonstrate internal leadership by example, and our experience told us it was the right approach when building a novel product. Using the agile concept of a minimal viable product (MVP), we focused on a streamlined experience that met business objectives and offered high value to the audience. Our interview process and persona development gave focus to a feature-set that was immediately useful, and we designed it with extensibility in mind for future iterations. As time passes, we’ll receive data and feedback to learn how audiences are using the Hub. This data will directly influence how future enhancements are approached, and guide the MX team how to focus resources, time, and budget. Since the Hub was concepted with an iterative approach from the get-go, the game plan was to design a site that offered maximum flexibility. In other words, an extensible foundation that can be grown – or modified – without major digital surgery. With this in mind, we developed a practical page grid that offers just one, two, or three columns. The layout also offers an abundance of negative space to add, rearrange, or delete components like photo galleries, user polls, videos, or just about anything else that merits consideration. The site’s typography and color palette are were also developed with ease-of-use in mind so editing in the Drupal CMS is efficient. This straightforward design allows much easier content creation, and making editorial design decisions easy for the MX team. When organizations are in the midst of top-down change, projects often experience drastic pivots in goals, priorities, and features. The one thing that usually stays constant is the timeline. This scenario held true for the MX Hub since it needed to launch in sync with a high-visibility marketing summit conference. Failure was not an option. Here, again, agile methodology was a key to success. By focusing on the minimal viable product, shifts in requirements were manageable, and we were able to launch the MX Hub exactly when the Genentech team required.